OMEGACLAD™ wire is metal-sheathed cable containing thermocouple wires which are insulated from each other and from the sheath by highly compacted magnesium oxide (MgO). Metric size OMEGACLAD™ wire is available in 304 Stainless Steel, 316 Stainless Steel, 321 Stainless Steel Inconel 600 and SUPEROMEGACLAD™ sheathing. To order, specify the desired model number and desired length in meters. Example part numbers are shown below. Use the 'Part Number Builder' below the 'To Order' box to order additional part numbers. 304 stainless steel sheath, type J wire, MgO Insulation, 1.5mm sheath diameter. The price shown is the cost per meter. Enter the desired length(in meters) in the 'Qty' box. Minimum length is 5 meters. Inconel® 600 sheath, type K wire, MgO Insulation, 1.5mm sheath diameter. 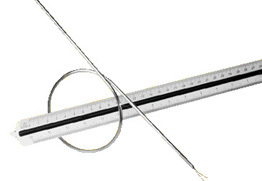 Enter the desired length(in meters) in the 'Qty' box. Minimum length is 5 meters. 304 stainless steel sheath, type E wire, MgO Insulation, 4.5mm sheath diameter. Enter the desired length(in meters) in the 'Qty' box. Minimum length is 5 meters. •For 310, 316 or 321 stainless steel sheath, change “304” in the Model Number to “310”, “316”or “321” (non-standard partnumber); no additional charge. •For SUPER OMEGACLAD™, change “304” in the Model Number to “SUP” (non-standard partnumber, price given on request). •For Hastelloy-X, change “304” in the Model Number to “HASTX” (non-standard partnumber, price given on request). •For Special Limits of Error, add suffix “-SLE” to Model Number (non-standard partnumber); add 20% to price.